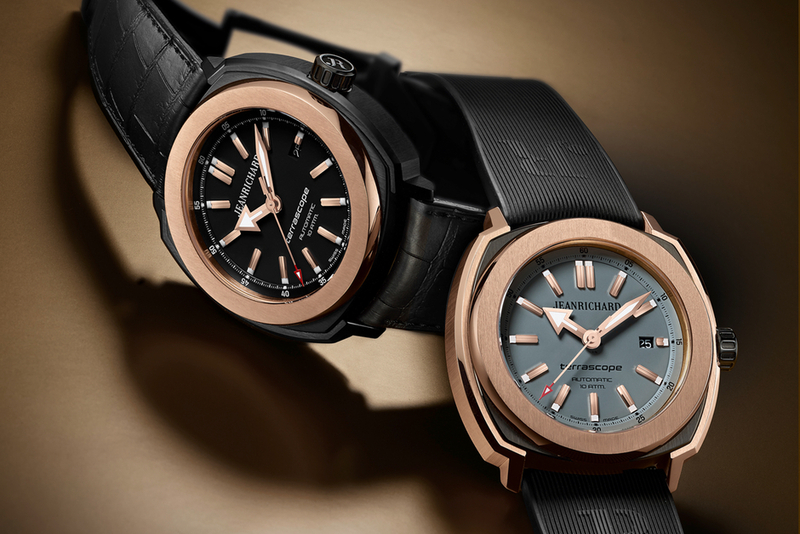 The Jeanrichard Summer Terrascope in Pink Gold showcases the design prowess of this Swiss made brand. The collection is offered in three different iterations all playing with the same theme. The watch cases are divided into three sections – each with their own permutations of materials that include stainless steel, DLC stainless steel, and 18kt pink gold. The cases also feature varying finishes such as vertical satin finished, polished, and sand blasted. For a flagship collection, it is hard to do better than the Terrascope for its unique and clean design. The square cushion shaped case gives the timepiece a retro look, which is more or less Jeanrichard’s M.O. The case comes in a 44mm case diameter with a 12.6mm case height. When worn, this model gives great wrist presence without being too overpowering. What stands out is the awesome usage of color and detail on these timepieces, making for watches that aren’t limited to summer wear. The Terrascope line comes on either black alligator leather or black striated rubber, both featuring a single deployant clasp for a balanced feel when on the wrist. This superior gent’s watch is made to withstand 100 meters or 10 ATM of water pressure. The dials come in a black or grey version with rose gold toned hands and hour markers. Both the hands and hour markers are coated with lume so that the time can be read at night. At the 3 position is a small date aperture that doesn’t intrude on the symmetry of the dial on these models. Protecting the dial is a sapphire crystal, chosen due to its scratch resistant nature. Powering this model is a Swiss made self-winding mechanical movement that carries a total of 42 hours in power reserve. The caliber used in the Jeanrichard Summer Terrascope is called the JeanRichard JR60. This timepiece carries a standard two year warranty valid all over the world.